The EURUSD continued its bearish momentum yesterday. 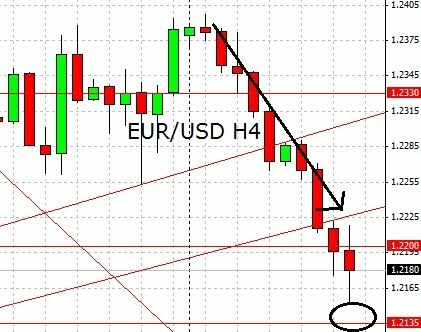 On h4 chart below we can see that price not only break below the trendline support but also slipped below the major bullish channel indicating a serious threat to the bullish correction scenario and technically price is now ready to resume its major bearish scenario especially if able to break below 1.2150/40 region targeting 1.2000 area. The bias is bearish in nearest term but CCI in oversold area and heading up on h4 chart indicating potential upside rebound. Another upside pullback inside the bullish channel could lead us into neutral zone in nearest term and keep the bullish correction scenario intact. Immediate resistance at 1.2250 followed by 1.2300 region. The EURJPY had a significant bearish momentum yesterday, break below the triangle as you can see on my daily chart below indicating potential bearish view testing 106.75 region. Immediate resistance at 108.50 region. Break above that area could lead us into neutral zone in nearest term testing 109.50 area but the main scenario remains to the downside at this phase. The GBPJPY had a bearish momentum yesterday, slipped below the bullish channel indicating serious threat to the upside correction scenario especially if price able to move below 132.90 region today targeting 131.00 area. On the upside, another movement back inside the bullish channel could produce a false breakdown scenario which could trigger significant bullish momentum testing 134.50 – 135.12 area and keep the bullish correction scenario intact. The AUDUSD had a significant bearish momentum yesterday, break below 0.8550 indicating bullish failure. The bias is bearish in nearest term testing 0.8350 region but the medium outlook is neutral. Another movement back above 0.8550 could lead us into neutral zone in nearest term as direction would become unclear testing 0.8650 area. The GBPUSD bullish momentum was paused yesterday, but so far price still able to stay above 1.5000 region. The bias remains neutral in nearest term but overall we are still in upside correction phase. Break below 1.5000 could trigger further bearish pressure testing 1.4900 area. On the upside, consistent move above 1.5080 – 1.5100 area and the major trendline resistance (blue) could trigger further upside pressure testing 1.5200 region before targeting 1.5400 – 1.5500 area. The USDJPY had a significant bearish momentum yesterday, after break below the descending triangle as you can see on my h1 chart below. The bias is bearish in nearest term but we need a break below 88.23 region to continue the bearish pressure towards 87.35 area before testing 84.82 region in longer term. Immediate resistance at 88.70. Break above that area could lead us into neutral zone in nearest term but the main scenario remains to the downside at this phase. The USDCHF had a moderate bearish momentum yesterday. The main scenario remains to the downside targeting 1.0750. Bullish view indicated by CCI divergence as you can see on my h4 chart below. Immediate resistance at 1.0900/50 region and the minor trendline resistance (white). Break above that area could lead us into neutral zone in nearest term but as long as price move inside the major bearish channel the bearish scenario remains intact. I expect to see the euro head toward parity against the dollar by the end of the year, if not before, as investors give up on the idea of a stronger global recovery and become more risk averse. Ironically, Asia may be leading the way as China, the world’s fastest growing economy, looks set to slow. The U.S. Conference Board revised its measure of China’s Leading Economic Indicator from 1.7% to 0.3%, the smallest gain this year. The data from Japan has been even worse- First, May’s unemployment rate unexpectedly rose to 5.2% from 5.1% in April vs. the consensus expectation of a decline to 5.0%. May’s industrial output had been expected to be flat after the 1.3% gain in April, but instead declined by 0.1%. The most disappointing report, however, was overall household spending which fell 0.7% on a year-over-year basis in May as opposed to an expected 0.3%-0.5% increase. Recent reports have showed retail sales plunged 2%, their biggest drop since early 2005. Deflation is hitting Japanese wages, which are off 2.4% year-over-year. The implications for consumption going forward are obvious. Global equity markets experienced steep declines during Tuesday’s trade. The MSCI Asia-Pacific Index fell 1.6% with Chinese shares seeing the largest sell-off, sending the Shanghai Composite to its lowest level in 14 months off the revised Leading Economic Indicator report. In addition the recent decline in Chinese equities made for a difficult environment to launch the last IPO of a major Chinese bank and reports suggest that the Agriculture Bank has had to cut its price. European markets were off 2%-3%. The global slowdown story is taking a toll on basic materials, industrials, oil and gas. Financials outpaced the overall market to the downside. In the US, the S&P 500 slipped by 3.1% after the Conference Board’s confidence index slumped to 52.9 this month from a revised 62.7 in May. The index averaged 97 during the expansion that ended in December 2007. Significantly, the gauge of expectations for the next six months dropped to 71.2 from 84.6. Safe haven demand pushed the US 2-year note to a new record low yield while driving the 10-year yield below 3% and the 30-year bond yield below 4%. In Europe, core bonds markets, like Germany, France, and the Netherlands and UK gilts are also seeing strong safe haven demand, however, peripheral bond markets fell as spreads widened out. Credit default swaps appear to be leading the bond market itself, with five year Spanish CDS is posting a new record high, but all the peripheral countries, including Ireland, saw pressure on credit-default swaps. I wrote back in February that the Fed was withdrawing policy, by ending Quantitative Easing, too soon. The Central Bank, which ceased Quantitative Easing in March, will likely consider resuming the program should Friday’s NFP report shows a lose in private sector jobs. Jobs are a by-product of 2 phenomena; new innovation, and credit bubbles. Neither one is likely to happen in the near future, which means that the 8 million jobs lost since the start of the recession in December 2007 will not be coming back any time soon. And while it is always possible to see the NFP surprise to the upside on Friday, the bottom line is that there will be no significant, sustained job creation in the months to come. Yesterday, we noted that the G20 meetings were inconclusive. Getting 20 different opinions to agree is probably a difficult task. The markets responded by trading in a somewhat horizontal fashion. A report observed that nowadays, the markets mostly react based on emotional triggers rather then fundamental data. Lastly we explored a report stating that the states in the US face a budget crisis which required immediate attention. Deficits need to be trimmed as soon as possible. Looking at the EUR/USD chart above, it is obvious that the momentum is bearish. The currency pair merely hesitated at the various trendlines and supports before cutting through. S&P 500 had a massive drop too and is now at 1046+. Gold drops to $1234, pressured by the stronger US dollar. Risk aversion is out for the hunt. A general strike happened in Greece today and it was the fifth one for the year. Over 9000 protesters marched and state services were affected. Investors do not like sovereign issues and this extinguished risk appetite. With an already weak economy, Greece cannot afford such issues. Investors will probably pull out of the country and further weaker the economy. This of course will also cause concern with regards to the Euro Zone on the whole. Over in the US, the CB Consumer Confidence turned out worst than expected. As this data is often a leading indicator of consumer economy, it is important to the investors. Seeing the red result, investors are dismayed especially when the US seems to be doing a good recovery. I am always reminding that the US is not as “strong” as it seems to be. Housing and employment remain weak and the budget deficit makes Greece’s seems like peanuts! If you are wondering why will the US dollar strengthen then, you need to head to the Koala Forex College ASAP! Risk Aversion is the key! Tomorrow brings us the German Unemployment Rate. As Germany is the largest economy in the Euro Zone, this is significant news. In the US, one of the main highlight will be the ADP Non-Farm Employment Change which investors look at to get a prediction of Friday’s US Non-Farm Payroll. If bullish relief arrives, we may see 1.22/1.23. Continued bearish momentum may take us to test 1.2135. Ok! I am about to wrap up my article and i hope i don’t fall asleep during these last critical moments 😛 You know, since the longest i remembered, i always struggled to make everyone happy and everyone like me. I KNOW for a fact this doesn’t happens. However i simply can’t bear to see someone dislike me. It affects me too much for my own good. Any tips on how can i deal with this? Arrrgghh. The EURUSD failed to continued its bullish momentum yesterday. On h1 chart below we can see that price is now struggling around the trendline support area. Overall we are still in upside correction phase but a consistent move below the trendline support and 1.2240 could trigger further bearish pressure testing 1.2200 – 1.2150 area and could be a serious challenge to the bearish correction scenario. On the upside, we still need a break above 1.2465 resistance area to continue the bullish scenario at least testing 1.2645.